There is an overused phrase that is used in various occasions. Translated, it means that you had two times to get it right, so this third one better work. Such is the case of the Honda Insight. The first time around was revolutionary – one of the first vehicles sold in the USA that combined an internal combustion engine with an electric motor for complete propulsion. Technology-wise, it put Honda on the map. Execution-wise, it was not the kind of vehicle most people want. A two-seat hatchback that looked like something from a Sci-Fi film was not what the public wanted from a hybrid. Yet, Honda attracted those who looked forward into the future and found this commuter hatchback to be just fine – narrow low-rolling-resistance tires and three-cylinder gas engine included. The second coming of the Insight arrived as its main rival – the Toyota Prius – became the darling of the green set and of Hollywood. The new Insight aspired to follow suit by offering a four-door hatchback and design quirks of its own. It grew in size and added the fourth cylinder to its gasoline engine. Yet, it was deemed too small compared to the Prius. Then again, the Prius grew to slot in-between the Corolla and Camry while the Insight was actually based on the Fit subcompact. It’s been a few years since the last Insight was sold in this country. Now, we have the third iteration of Honda’s hybrid compact car. It is no longer a hatchback, but a very stylish sedan. It has all grown up to become a serious – and fun-to-drive – commuter sedan. Did Honda get this one right? Is the third time the charm? Consider the leap in the design of the new Insight. 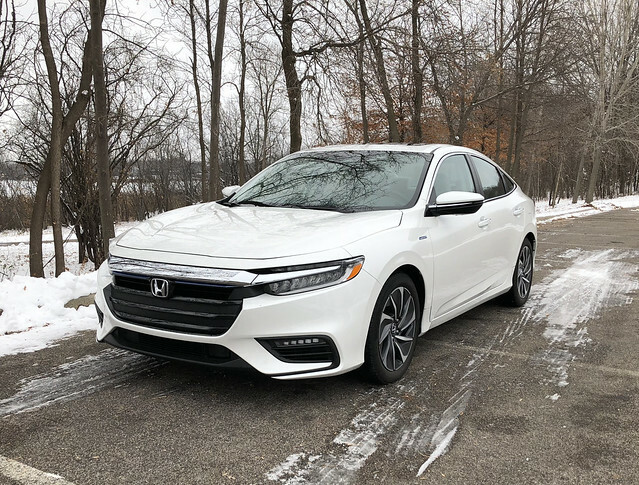 It is part of the brand’s new design language, which appears to be a mix of the latest Honda Civic Sedan and the Honda Accord. Both are equally stylish and compelling designs in their own right. The combination of elements from both popular models helps to not only “normalize” the insight into the lineup, but to create a distinctive and extremely handsome vehicle when compared to other electrified-only models from Toyota, Hyundai, and Kia. In fact, it is a downright handsome sedan with its distinctive character aside from the Civic Sedan and Accord. The front end is the best interpretation of the design language yet. More compelling was the split headlamp units combining LED turn signals and running lamps. The flow from the front end may appear a bit more conservative compare the Civic and Accord, but it is still a distinctive silhouette. The rear end shows a couple of unique design pieces. The way the C-pillar extends beyond the trunk opening encasing the rear glass a bit further back. 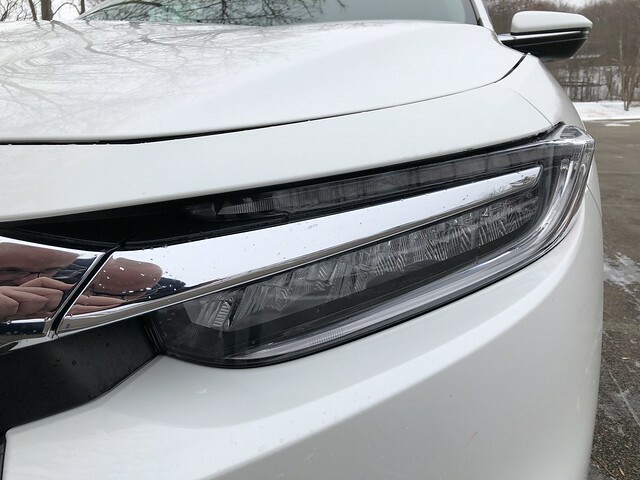 The taillights are a bit of a throwback, if you recall the Accords from 1998 through 2007, with the turn signal lens curling over to cap the upper rear quarter panel. In truth, the Insight is built on the Civic Sedan’s platform with just an inch separating the two. One may think that they have made a better Civic in the Insight. For its intended purpose, the Insight should welcome new and returning customers with its charms on the outside. What will sell these customers is the interior. 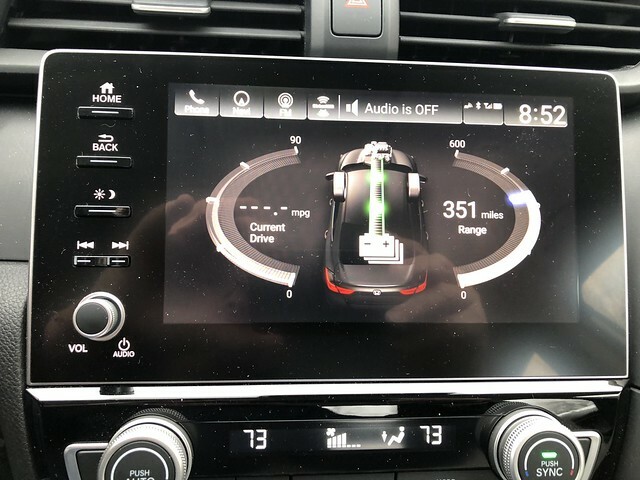 There are a lot of Accord elements throughout – from the full TFT instrument binnacle in my Touring tester to the push-button transmission. The single-screen infotainment system crowns a cleaner center stack – again taking cues from the Accord. In all, the Insight is designed for drivers who want more from their hybrid. The Touring tester offers these Ivory leather seating surfaces with contrasting black elements throughout the cabin. The front seats are from the Civic, but they appear to be more accommodating for most bodies, with just enough bolstering and support for longer drives. The driver’s side seat is electrically adjustable for rake, recline, and height. Rear seat room appears to be equal in space to the Civic Sedan. Four average-sized adults will enjoy the Insight on runs across town – and, perhaps, some app-based ridesharing duty. Trunk space is exactly the same as in the Civic Sedan – 14.7 cubic feet in the Touring trim, with more available as the seats fold down. Honda’s infotainment system has been improved recently and it shows. 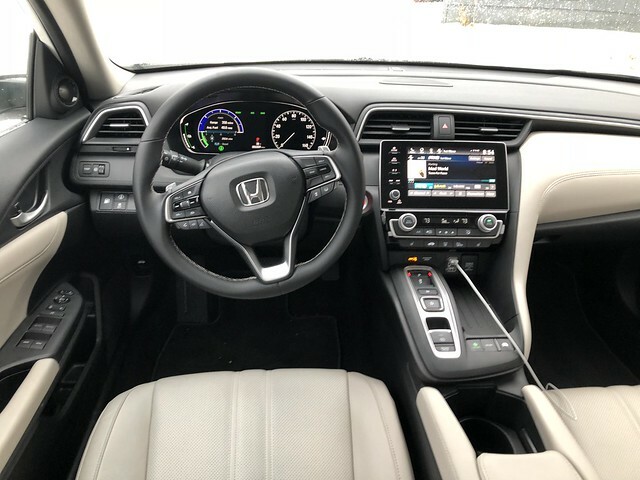 The screens are easier to navigate while offering quick connectivity to your smartphone by either Bluetooth, USB port, or through Apple CarPlay and Android Auto. Not to mention, there’s a Wi-Fi hotspot powered by AT&T that works very well with your devices. The Touring model offers 10 speakers of balanced sound that makes driving quite a treat. The Insight is powered by a combination of a 1.5-liter four-cylinder engine and an electric motor. This combination offers a net power output of 151 horsepower. The electric motor alone puts down 197 pound-feet of torque. This hybrid is pretty responsive, but that continuously variable transmission can spool up before settling down into cruising speed under heavy throttle. Otherwise, it is a tame powertrain that offers plenty of smooth operation across town and on the highway. One important part of this Insight that had been touted was fuel consumption. If you looked at the sticker, you will notice that it should get up to 51 MPG with an average of 48 MPG. With colder temperatures and snowy conditions, I managed an average of 40.0 MPG. I know I could do better, to be honest – so, please accept my apologies for not getting to the magic numbers as stated by Honda. 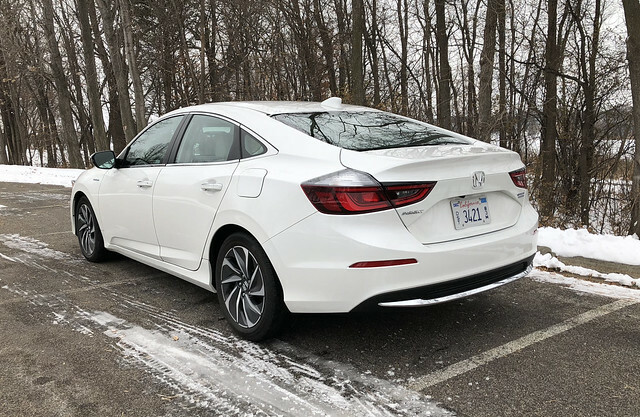 There is a phrase I would like to use since it has been exhibited in three Civics and an Accord over the past few years – “it drives like a Honda.” That has new meaning since the driving dynamics and character is truly more sporting than just plodding along saving fuel and emissions. Look no further than the multi-link rear independent suspension, which makes tracking through the corners exciting. The ride quality has not been compromised, as it is smooth with a lot of absorption of bumps and cracks along the way. Steering is done with a superb system that was precise and responsive. I like the on-center feel at the wheel, as well as the tight turning radius. Braking was also good, exhibiting solid stops in normal and panic situations. Add the Honda Sensing driver assistance suite, and you have an all-around compact sedan that is truly worth living with. The base price for the 2019 Insight is $22,830 for a well-equipped LX model. My Touring tester came with a sticker price of $28,985. Honda has figured out how to turn the Insight name into a very good compact hybrid sedan. 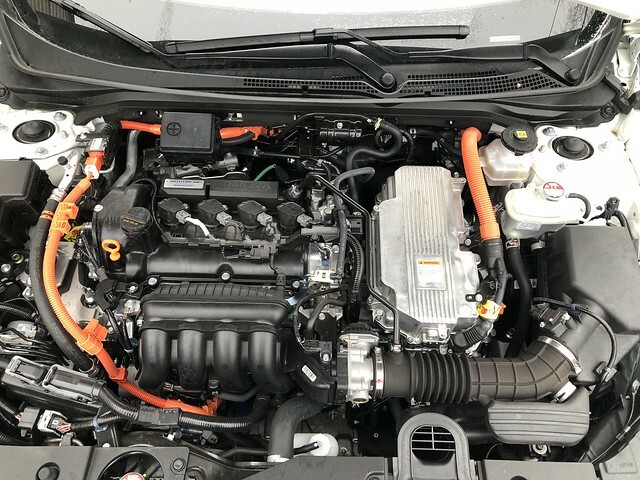 It drives very well and offers consumers a more mature package that should be strongly considered against the other electrified models it competes against. Yet, there is that elephant in the room. Could have this been considered a Civic instead of creating its own model based on the Civic? Perhaps Honda was on to something when they chose to create an Insight that was distinctive and offers its own personality apart from the Civic. 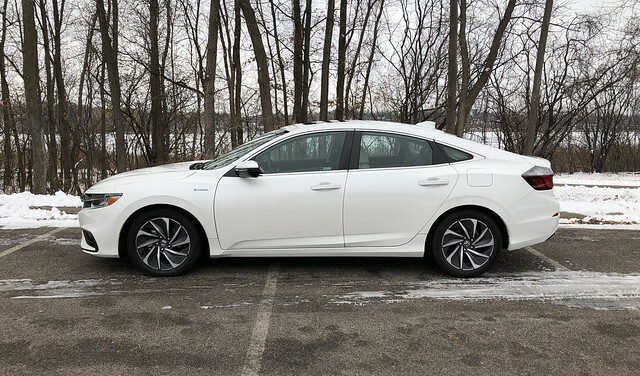 If you’re looking for a Civic Hybrid in the near future – forget it! The Insight fills that role with style and poise. It is worth saying that if you had the previous two Insights – or currently have one – you will love this third iteration of your car. Indeed, the third time is truly the charm for Honda. DISCLAIMER: Vehicle provided by American Honda Motor, Inc.